We’ve been gripped by the FIFA World Cup 2018 here at Intelligence Towers. There were high scores and high drama as old favorites crashed out early, leaving underdogs to progress to the latter stages. It was the most uncertain tournament in decades. Uncertain, perhaps. But apparently not unpredictable. 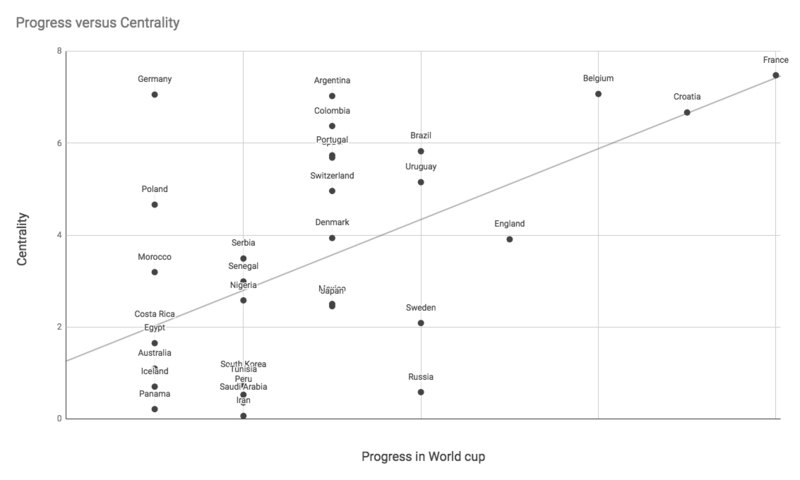 A couple of weeks ago, at the start of the round of 16, we used network theory to make a tongue-in-cheek prediction of the World Cup winner. To everyone’s surprise, the predictions turned out to be remarkably accurate. Let’s take a closer look at what happened. Our prediction was based on this dataset by Paul Campbell. It lists players in the World Cup, their clubs and countries of origin. We had no data about squad or player history, performance, or injuries. But we didn’t need that – we had network science. 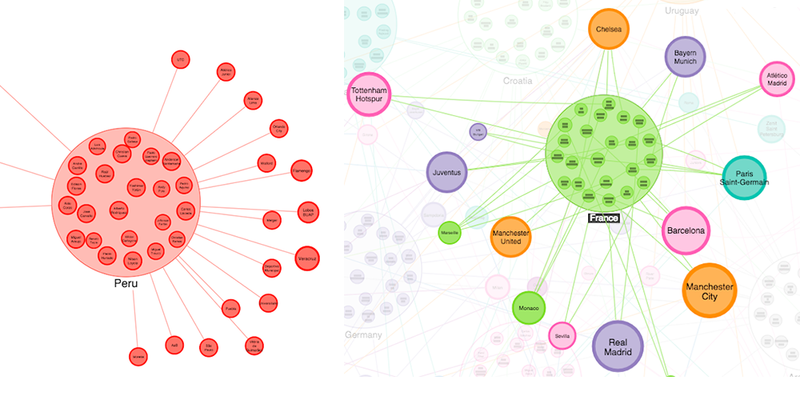 To find the teams with the most wide-reaching connections, we used a social network analysis measure known as Eigenvector Centrality. Eigenvector Centrality scores each node by how many connections it has, weighting those connections by how many connections the node at the other end of the link has, and so on. 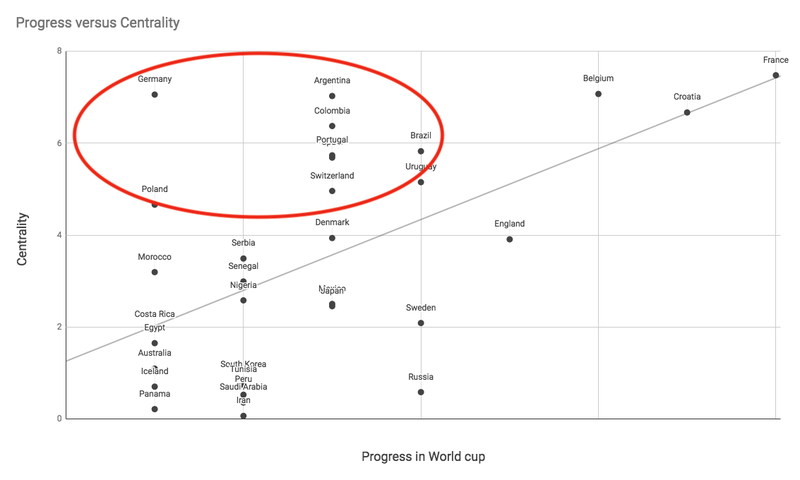 Based on our theory, teams with higher centrality scores are more international and therefore should progress further in the competition. How did we do? On the left-hand side of the chart, we see the teams that were knocked out at the group stage. On the right-hand side are the teams that progressed further in the competition. 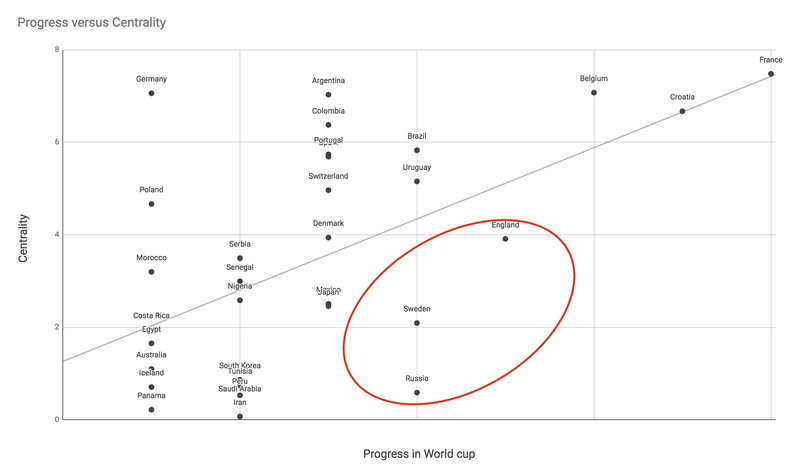 Pleasingly, adding a trend line we can see some correlation between the centrality score and team progress in the World Cup – backing the prediction. 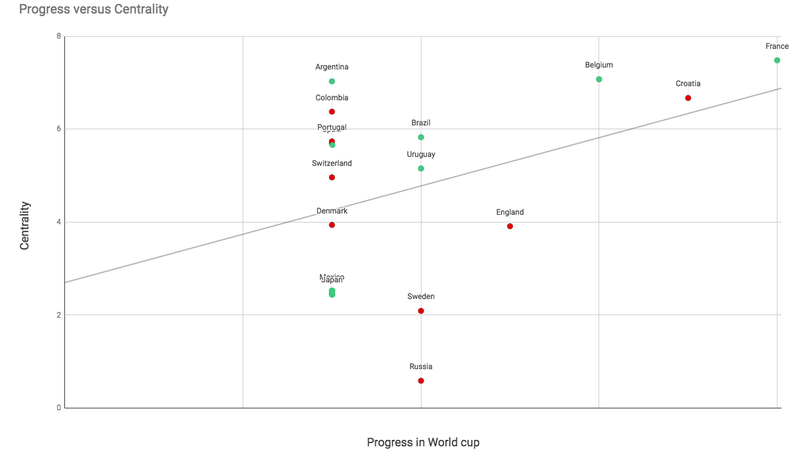 Russia, Sweden and England all progressed further than their centrality score implied they would. On the other hand, it’s fair to say Germany, Argentina and Brazil expected more from their national teams. One often-cited reason for this year’s unexpected results was the uneven distribution of quality sides in each half of the draw for the knockout stages. By the round of 16, it seemed that the majority of teams in one side of the draw consisted of historically strong teams (including France, Argentina, Uruguay, Brazil and Belgium), and the other with historically weaker teams (like Russia, Denmark, Sweden, Switzerland and England). Here the teams are colored based on which ‘group’ they belonged to: red being the weaker side, green being the stronger side. There’s a bit of spread, but generally the weaker teams had a lower centrality score and the stronger teams had a higher score. But in the end, the strongest team won. There are lots of ways we could measure the accuracy of this prediction, but what matters most are the results. If we’d used centrality scores to predict the winner of each match, how often would we have been right? Bookmakers make billions by predicting the outcomes of sporting events, but we all know animals are the real oracles when it comes to the World Cup. In 2014 we had Paul the Octopus, in 2018 we had Zabiyaka the Goat. How do our predicting abilities compare? From the 16 matches in the knockout phase, we were right 12 times, or 75%. From the quarter finals onwards, all predictions were correct. Zabiyaka the Goat, on the other hand, seems to have got most of her predictions wrong. This was a fun experiment to see how far social network analysis can take us when exploring a new dataset, but there are real world uses for this approach. Often threat analysts work with incomplete data and need to extrapolate insight from the information they have at hand. Analyzing connections is often a great way to get deeper insight into the nodes themselves. Modern day intelligence (probably unlike football punditry – we’ll go back to our day jobs now) is all about quickly prioritizing from large amounts of incomplete connected data – and in that scenario, graph analysis could be invaluable. If you’d like to kick off your own evaluation, request one here.